Despite having diabetes, he is the the go-to guy for the Mustangs when the game is on the line. When a game is on the line, teams don’t always get a second chance. That’s the reason Nick Hurowitz usually gets the basketball in the critical moments for Mount Sinai. The 6-4 senior leads the team in scoring, rebounding and assists and het typically gives the Mustangs the best chance to succeed late. It’s possible that Hurowitz excels in those pivotal situations because he considers himself to be operating on a second chance. The 17-year-old slipped into a life-threatening condition known as ‘ketoacidosis’ during a CYO doubleheader eight years ago, registering a blood-sugar level of 900, where normal, according to UMass Medical Center pediatric emergency medicine physician Ted Macnow, is in the 70-100 range. But he came out of it unharmed because of the quick work of the St. Charles Hospital emergency room team. And though he lives what looks like a fairly normal high school existence today, his life was forever changed when he was diagnosed the next day with Type I diabetes, which is a lifelong condition. He has gone from receiving four-to-five daily insulin injections the first couple years — administered by his mother, Nancy, or school nurses — to doing as many daily finger-prick tests and self-administering insulin through a pump connected to a needle implanted in his backside. Every serious player has their pregame routine. So does Hurowitz, but it also includes checking his blood glucose an hour before tip-off and again 30 minutes later. He said “it gives me enough time to adjust something if I need to.” He said he removes the pump that is usually taped by the small of his back and the tube that runs from it to the implanted needle before games and tapes over the needle to make sure it remains in place during game contact. On that day eight years ago, though, it was panic for Hurowitz and his family in the early going of the second game in Deer Park. In the week leading up to it, he’d been overproducing urine and excreting valuable sugars and electrolytes. It seemed a curiosity but not quite a red flag, Rod Hurowitz said. “But when the second game was starting, he almost had to push himself off the bench for the start,” the father recalled. “He took some loping strides and I knew he didn’t look right." When he asked out of the game and [during a timeout] raced off the court and into a nearby men’s room, Rod followed. He found Nick splashing water on himself to try to cool his dehydrated and overheating body. “Dad, I’m bad,” is all Nick said. His parents whisked him to St. Charles in Port Jefferson — Rod described the panicked drive as “sometimes hitting 100 mph” — where he was stabilized before being transferred to Stony Brook Children’s Hospital. He’d fallen into “diabetic ketoacidosis,” Macnow said, where his dehydrated body was starved for sugar and began burning fat rapidly enough to turn his blood acidic and make him ill.
To watch him play — and he has been one of the better players in Suffolk County this season averaging 20.2 points, 10.5 rebounds and 4.0 assists — one would never know. 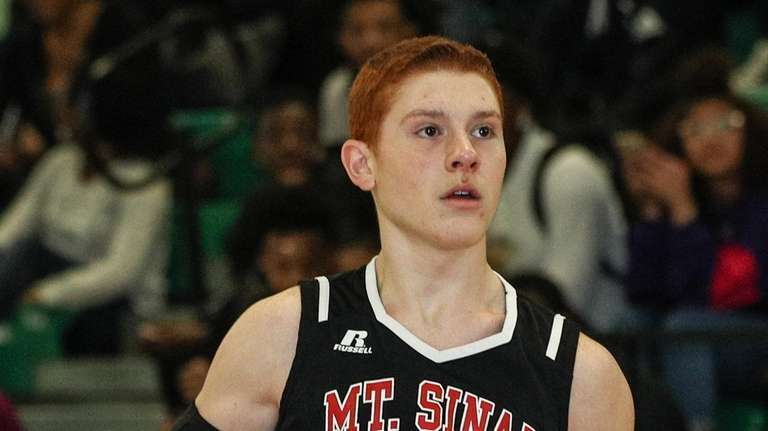 The red-headed hoops star even has the student body at Mount Sinai speaking the slogan “Dread The Red” at games. Though Hurowitz will always have to self-administer insulin — and adjust as his body changes — it won’t interfere with him realizing a dream: playing college basketball. A handful of Division II programs and several Division III programs have expressed interest.